So Sunday, I was at the 'rent's house, having just consumed a wonderful Sunday dinner, and had Mom give me a haircut. Julia needed her bangs cut, so while that was going on, I sat around with Dad. Dad then asked if I'd be willing to take his riding mower and cut Ma's (my grandmother who lives next door) lawn. Being the dutiful son, I went over and mowed. I was driving back when I decided to relive the past a bit. My grandfather (Father is how I knew him) was a wiz with small engines. Lawn mowers, outboard motors, chainsaws, weed wackers, whatever, he could fix it. (He once rebuilt a motor scooter for Dad that came entirely in milk crates and boxes.) Anyway, if you were from Spruce Head, and you needed your lawn mower fixed, you took it to Father. If your mower was too far gone, and not worth fixing, you just bought another one from him. You could get your average mower for $15, and $35 would get you a "cocker" (I guess that's how you spell it--that's how he'd pronounce something that was very good) with self-propulsion. Anyway, when Father would get a mower fixed, he'd take a couple of quick passes with it over on Dad's lawn. He'd just cut a couple of big swaths, and leave the rest. Dad would be furious! It looked awful, a couple of paths cut through the grass. It stood out like a sore thumb. So as I'm driving back to put Dad's rider away, I decide to give him an homage to his father, my grandfather, Father. I dropped the blade as low as it would go, and smiling this crazy goofy grin, I made a couple of loop-de-loos on Dad's yard. Mom said she was sure Father would be smiling up in Heaven. I'm at the shop when former Spruce Heddah Sumner Kinney stopped in, just as I was loading my mower into the truck. "Where's your grandfather when you need him?" he said. "Yup," I replied, "this is the first time I've ever had to pay for someone to work on my mower." "Gone are the days of the $15 mower" Sumner said. "Yeah," I said. "I remember back when if your mower got too far gone..."
"...you just bought a different one," Sumner filled in. "I accidentally put kerosene in my tank. I can hear your grandfather yelling at me now." True, he was a yeller. Stubborn, ornery, a true Maine codger in every sense. And yet, I miss him so much. So I'm working this morning with David "Quick" Clarke. A little bit slower than average, I'd say. Fine by me. I got home about 3:30 this morning, so 8am came right quick. Big day planned for today too. After I get done here, Jim and I are going to a gun show in Augusta. (Jim's looking for a shotgun.) Then, I need to go to The Drum Shop in Portland, Jim needs to hit the mall, and I think we're going to Vinny T's for lunch. Then to OOB for a gig at House of David. Found this on ebay yesterday: a Lang Gladstone replica. Nice. Put me down for one. Just not anytime soon! Johnny A is this cool guitar player from Boston. I've seen him twice; he opened for BB King and Robert Cray. I liked his stuff, and he's got a great band. But I never hear anything about him. Other than Jim (who also saw him in concert), no one has ever mentioned him to me. So imagine my surprise when I opened the Musician's Friend catalog last night and saw the new Johnny A Gibson Signature guitar. Funny part? Those are not the guitars he used in concert. He was using Les Pauls with Bigsbys on them when I saw him. He must of custom designed this one himself. 1. Do you like to eat out and if so how often? I do like to eat out. Lately, I've been eating "out" a lot. Really, I've been bringing fast food home. I haven't really got much choice in the matter. Susan is busy making sure the twins eat, and that's taking more time than you could possibly believe. And the last 2-3 weeks, I haven't been home much, so good home cooking has been slack. I do like going to nice restaurants, though, and wish we could do it more. 2.If money were no object would you eat out more than you currently do? Sure. If money were no object, the quality would go up too. But I'd also need more time. When you go out, you've got to devote an hour or two to the experience. Those two hours just haven't been around recently. Italian would be my favorite, with Chinese and Mexican coming in second, and a ways back. I like French, but there's not much around here for that. I'm not a huge steakhouse fan, though the author of this MI-5 is. I like steak, but it's not a favorite. Pasta and cream sauces really are my thing, baby. 4. Do you have any favorite dishes or styles of food when you eat out? Oops! See the end of #3. I like to try new things when I eat out. Like at the Maccaroni Grill (a chain Italian place I like) I try to order something different every time I go. Things that I love that I discoverd by adventerous eating out? Quail, duck, lamb, hollandaise, escargots, mussles, calamari, anything marsala (chicken, veal, whatever), artichoke hearts, and a whole mess I'm sure I'm forgeting. These are things I didn't eat growing up. I was introduced to them by trying them while out. 5.If you could only go to one restaurant for the rest of your life which one would it be? This can be a chain or a single restaurant. Oh, man, that's a hard one. I wish Ingrahams was still open--I'd probably pick there. I guess I'd pick the Samoset. The food is good, and the variety is huge! Great breakfast, sandwiches at the pub for lunch, Marcels dining room for supper--they've got the bases covered. So Susan and I were watching this country music rumor thing on TV the other night, and I heard this great story from Me Tillis. Now Mel has a stammer. He sometimes just can't get words out of his mouth. Well one night, he's in a hotel room with a couple of bandmates, and he sees someone breaking in through the window. He's so frightened, he can't even speak. But his stammering doesn't affect him while he sings. So he starts singing "Get up guys, someone's is breaking into the room!" So they wake up, and guess who the guy is? It's Johnny Paycheck! Also, Carly Simon used to stutter. But she didn't stutter when she sang. That's how she took up singing. Also something else funny seen on tv recently: the Jimmy Dean Sausage Biscuit commercial. It's a bunch of people with no reading experience trying to deliver copy. Completely flat, but oh so funny. Thanks to the ladies of MIS! Amy brought over some mac and cheese for Susan on Friday while I was away at my gig. (I left the house at 7:45 Friday morning and didn't go back 'til 2am Saturday.) I ate some of the leftovers for lunch. And then, Gina gave me some leftover onion rings from her lunch. Rock on! And for dessert? A York Peppermint Klondike Bar. I'm not usually an ice cream fan, but I've been into the novelties lately. First, it was drumsticks. Then, chocolate Klondike bars. Now this. Let me tell you this, though. I'm ready for a nap now. Leedy Dreadnaught, just waiting for someone to take it home and love it. Couldn't you see this drum in a nice creme lacquer? See the "Get More Here" section for the quizes. 1) What is the first birthday you really have a memory of? Tough one. I'm going to guess age five or six. I have a picture of a birthday party with a bunch of friends: Janice Yattaw (now Janice Cox), Eric Bunker (now desceased), Denny Davis (now who knows? ), Eric Godin, and Jason Butman. It was a skull and crossbones themed party. Not a pirate party, mind. The emphasis was on the skull. I had a skull and crossbones cake, and we played pin-the-crossbones-under-the-skull. I still have a fascination with skulls. 2) What was you favorite childhood birthday? None really spring to mind as a favorite. I remember my twelveth birthday as being somewhat unusual, though. Someone (my sister maybe) entered me in a drawing for a McDonalds birthday party. I was a little old for that kind of thing, but we did it anyway. This was back when the Rockland McDonalds had a playground out front. There's a picture of me somewhere with a bunch of my friends hanging out of a Mayor McCheese climby-thingy. 3) What was your most interesting/adventurous birthday as an adult? I'm not much into birthdays, really. Ususally, I pick what the family has for Sunday dinner. There will be some cake with frosting from a can (I like canned frosting). 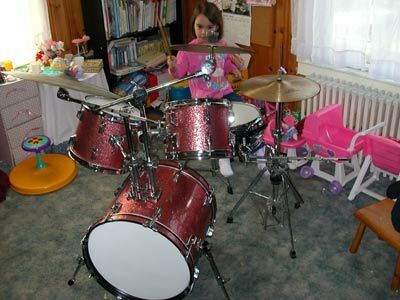 My folks will renew my subscription to Modern Drummer. My sister will get me a calendar of some sort, and what I get from Susan will be up in the air. That's about it. 4) If you could have one physical thing, ONE thing, for your birthday this year, what would you want and why? Jump ball between Tama rosewood snare, Slingerland "Rolling Bomber" snare, a solid shell Slingerland Radio King with beavertail lugs and Super "clamshell" strainer, or some copper cookware. 5) Do you have any future plans for a special birthday for yourself (e.g. 40th or 50th)? None. See first sentence of #3. Listening to: Paddy singing "Kung Pao Chicken," a song he made up to the tune of "Kung Fu Fighting." So one of my drum students came back from music camp this week. He's been gone a month. Cost of the camp? Three large. I think I need to raise my lesson rates! He mentions to me that his parrents (specifically his dad) may hook him up with a used seven piece Drum Workshop in green lacquer with Zildjian cymbals. Cost? $2,300! I don't even have a kit that nice, and I own 5 kits! :-) (Six if you count the cocktail kit.) I guess my rates really do have to go up! What's up, G? We're just chillin', scarffin' down the pudding. Let's talk prayer, here. It works. I use it. It's cool. Ask Jim or Paddy about some time I put in for them with the Man upstairs. Then a couple of weekends ago, I was playing this club in Bar Harbor. It's right behind the public parking lot. Of course there's no parking in Bar Harbor in summer, so I prayed for a parking spot. I drove through the lot, and there wasn't a spot. So, I doubled back and took the street in front of the restaurant, instead of behind. There, right in front of the building, right next to the door was a parking spot. Thanks, God! So I'm playing this other gig on Peaks Island. We played outside, and by the time we were done, it was dark. (Of course it was dark, it was 10:45pm!) Since the only light was Clarke's light on his music stand, I used the inside lights on the van to provide us with illumination. After 1/2 hour or so of packing, I hopped in the front seat, and the battery was dead. I went to the back to grab the jumper cables, and asked one of the guys to find us someone with a running vehicle. The ferry from the island was leaving in 15 minutes or so, so we didn't have much time. On the way back from the back of the van, I prayed the car might start. I sat down, jiggled the gear shift, jiggled the steering wheel, and turned the key. Sl-ow-ly, groan-ing-ly I-got-a-turn-it-was-slow it caught! The vehicle that just a minute ago had nothing at the turn of the key somehow got enough juice to turn over one last time. I know where the juice came from, friends! This week, I'm taking the shotgun technique for the MI5. No, it's not about shotguns, silly. It's just five questions, but they're spread out; they're not about any one particular topic. Play along, won't you? Feel free to leave your answers in the comments section if you don't have your own website. 1. What 5 things are a "must have" in your refrigerator at any given time? 2. What 4 books would you keep if the rest had to go? I'd keep the Bible, a book I have of Chinese poems written in prose, Richard Brautigan's "Revenge of the Lawn," and my complete poems of Emily Dickenson. 3. You can only watch 3 TV shows for the rest of your life. What are they? M*A*S*H, Tales of the Gun, and Good Eats for me. 4. If you could have 2 of your childhood toys back, what would you want? For sentimental reasons, I'd like to have my Bugs Bunny drum set back. I also had this really great boat and undersea diorama that was really cool. It had this underwater backdrop, with the boat and a diver at the top. Then it had all these fish and sea creatures you could play with, pretending you were under water. I can't remember what it was called, though. 5. Most of us some kind of bad habit that we like--a vice of some sort. If you had to give all of yours up, what one would you keep? I have two of these, really. I enjoy the occasional beer, and the even less occasional cigar. If I could only keep one, the cigars would have to go. Random stuff here today. 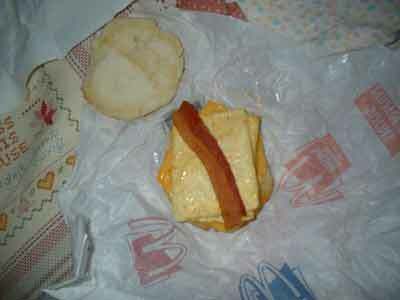 I was looking for the picture of the boys I posted yesterday, when I found this photo of a Bacon, Egg, and Cheese biscuit from McDonalds. What is up with the bacon? One measly slice? What happened to the two slices molded into a circle that allowed you to get bacon in every bite? This sandwich was just a travesty. Ok, travesty might be bordering on hyperbole, but it's still not right. Also found on the camera was a shot of what Dad and I call the World's Oldest Drummer. Mind, I mean no disrespect at all. This guy must be 80. And he marches in every parade around these parts! He's still out there doin' it, and marching with a drum slung over your shoulder in the heat of the day can get a little warm! But you always know when he's a comin'. His street beat sounds like no one else's. This Saturday, I played a club in Bar Harbor. In Bar Harbor is a place called Joe's Smoke Shop. Every season when we play in Bar Harbor, Blind Al and I go there and have a cigar. And, as is our custom, we did the same Saturday. Of course, this was the first time we'd been since Maine put the "no smoking in public places" law in effect. So Bar Harbor has a cigar bar at which you can't smoke cigars. The "no smoking" sign seemed misplaced. Anyway, they had this cigar that I'd seen advertised a bit, and I wanted to try one. I did, and for the money quite liked it. So I bought a box online. Those of you who want to celebrate the birth of the boys with the traditional stogie can see me in a couple of days. I found all kinds of neat photos stored on the camera today. I'll post some others later. 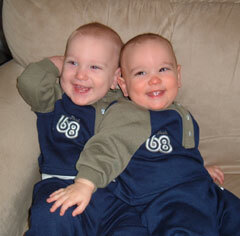 But I did find this good one: hungry Matt tries to get a snack by nibbling brother Nat's head. Matthew lost his cord stump yesterday. I got home from work, and Susan said "Matt's cord is about to fall off. It's only hanging by a thread. Can you change him?" So I took him over to the changing table, pulled his onesy up, and there it was, gone. "It's fallen off," I said. It wasn't in his diaper. It wasn't in his clothes. That means somewhere in our house is an umbiliacal cord stump! We finally did find it on the floor in front of couch. I think Susan's going to scrapbook it. Rick's dead, baby. Rick's dead. Rick James died today. He was 56. He'd already had a stroke and a hip replacement. As Jim said, being a 'super freak' isn't easy. I got word that I have the MI5 this morning. I hadn't really planned anything, so this one's pretty hasty. 1. How many hours of sleep do you need a night? How many do you get? Normally (normal meaning pre two weeks agos) I get 8 hours of sleep. Ususally to bed around 10:30, and up at 6:45. When I'm playing a gig, though, the sleep goes down a little. Sometimes I'll get home from a gig at 3am, and get up at 8am. So I can get by on 5 hours for a little while. Now here's the story that insdpired this MI5. Last night, Susan decided it was easier for her to sleep on the couch. That way, she can put the twins on her nursing pillow, and just leave them there. I slept in the bed of course. So I got a full night's sleep for the first time in two weeks. And you know what? I was draggin' this morning. I felt like crap. I felt worse than I do when I only get 5 hours of sleep. 2. Sleeping alone: on your back, stomach or side? Side. I usually start on my right side, and finish on left. 3. Someone's with you: spoons, bookends, or pretzel? It was our honeymoon. It was the first time Susan and I had slept in a bed together. We tried to do the whole newly-wed tangled up in the sheets thing. As we were trying to sleep, I asked her "Are you comfy?" "Not really," she said. We decided then that we should sleep how we were most comfortable. Since then, we've slept bookends. 4. Do you have any before bed routines? If so, describe. I brush my teeth and go to the bathroom one last time before bed. I like to listen to music while I fall asleep, but Susan's not big on that, so I don't usually do it. 5. Describe your sleeping environment. One year for Valentines Day, I bought Susan a lovely bed. It's a four poster, with a hammered verdi green finish, brass accents, and big floral finials on the posts. (Picture here.) We run a fan at night, as Susan likes the white noise. I use two pillows. I usually sleep in my boxers, and I don't like sleeping uncovered. I have a dozen or so books beside my bed in various stages of reading. I also have two Bibles next to the bed. I try to read several chapters each night from the NIV version, and I keep a King James there two for studying and back-up. I was playing at the Sea Dog in Bangor one night a few years ago. Pat came in with a date and another couple. They had just come from seeing the premier of Pierce Brosnan's first Bond flick. (I guess it was more than a few years ago! It was eight!) In order to really go all out that evening, the guys in this party wore tuxedos, and the gals wore expensive frocks. As they left, Pat decided to be a little playful. She got on her hands and knees and crawled across the stage towards me. You should have seen the bass player's face as the woman in a strapless gown crawled towards the drummer. He was ready to see some action! We had quite the laugh! He'd never met Pat before, and just assumed some stranger was commin' after me! 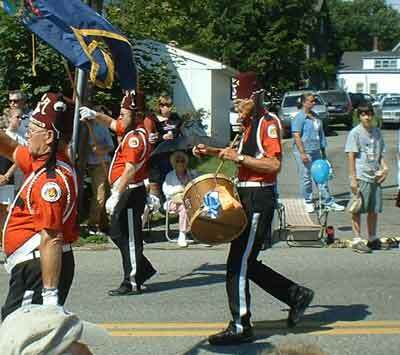 Listening to: A selection of MP3s, including Frank Zappa's "Dynamo Hum"
It's Lobster Festival week here in Rockland. That means parking is at a premium. I decided to just eat lunch here at the office today, and not bother to go home. So I warmed up some of Ma's leftover stew for lunch, and am currently listening to some MP3s on my computer. The set list? "Georgy Porgy" and "Hold the Line" by Toto, and "Murder by Numbers" and "Tea in the Sahara" by The Police. I updated the calendar, for those of you who are interested. I was so busy, I never got a chance to put July up! Hey Aunt Linda! I'll be working on putting up some new photos. Listening to: Frank Zappa "Apostrophe"
Went back to the office today. I was quite surprized to find only one voicemail message. Usually, I'll get two or three when I go on lunch. To be gone a week and only get 1? I think most of my ad reps knew the babies were due. In fact, I told most of them that if they called, and my voicemail said I was on vacation, then that would be their cue that the babies were born. Today, we took the boys in for their circumcision. What I thougt could be accomplished on lunch break took over 4 hours! Susan and I thought long and hard (no pun intended!) about whether we should "snip" them or not. There's so much info both for and against it. But I got some great advice from a client of mine who happens to be a urologist. Their pediatrician is against doing it. Even after we told her what our wishes were, she had these little barbs and opinions and thoughts that you could tell were trying to steer us away from our desicion. Even Susan caught on to what she was trying to do. I didn't appreciate it, but Susan likes her otherwise as a doc, so we aren't going to change.